The 2018 Kia Stinger is a hot commodity right now. The twin-turbo, 365-horsepower speedster is the best car Kia has ever made, it’s fun to drive, and it pushes you back in your seat when you punch it on the way to the laundromat. But with a nice tech upgrade, connecting a Google Pixel 2 smartphone over USB and running the Google Assistant, it’s even hotter. During our tests, it was easier to focus on the road and keep our eyes facing out to the double yellows, even with the hum of the exhaust filling our ears (you can even adjust how loud the hum sounds). Google recently updated the voicebot in Android Auto so that it’s no longer using the dumbed-down Google Voice search (for music, navigation, and other aids but without full search and voice support) and has now introduced the full Google Assistant. This means you can ask random questions about the news, check the hours of the local Walmart, and even check on trivia questions as a form of entertainment. When we asked the Google Assistant about President Donald Trump, we could inquire about his age and place of birth. The Assistant understands context, so you can say “how old is he” and Google understands. One cool trick – you can also set reminders for yourself and make quick task lists. Of course, like the Google Voice search previously, you can control navigation, music, and make calls. There are a few “gotchas” involved; as we adapt to how car technology works in the modern age, there are some growing pains. Google doesn’t tie into the Kia Stinger at all, so you can’t ask the bot to turn on the headlamps, for example. And, while the bot knows you're driving, it doesn’t contextualize too much. It would be handy if the bot could show pictures of what a destination address looks like, including photos of the area or an overhead sat map. Asking the Assistant to “show me pictures of the park at my destination” did not work at all. In an Audi Allroad, you can use Google Earth to see the surrounding area above you as you drive. Not so here. In the near future, voice assistants in cars could be far more advanced. We could ask to see more pictures, play movies on the rear-seat entertainment system of an SUV, or even ask the bot to call the driver next to us (perhaps one that needs some driving tips). Someday, we’ll ask the car to start driving for us, and the AI will know we’re running late to a meeting and offer to alert our team at work. That will take some serious coordination, but, to drivers, it could be a major bonus if it helps us focus on the road and serves as a true digital assistant. 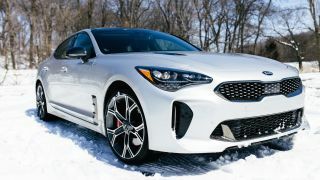 The Kia Stinger, at a base price of $31,900, does benefit from the voice services, and it’s easy to see how driving will become more natural and fun, possibly in the near future.